Coaching is a skill. Like any skill there are people who get very good at it. There are also those who take a course and put it in their resume but in practice are not very good. Before starting out on the journey it's a good idea to know where you're going. Better still, you need to know what you'll do when you get there. Even more important than that is to know why doing whatever you'll do when you get wherever you're going is such a big deal to you. Because if it's not a big deal then what are you doing on this path? If that's the case the chances are there's another path for you where the destination and all it entails, will be a big deal for you. It is true that most people will travel more than one path in their lifetime. Apparently there are children already born that could live for 200 years and have a fruitful and productive working life way beyond what's considered a retirement age today. Even fit and healthy people in their late forties or early fifties stand a good chance of making it well past the hundred year milestone. As I fit into that bracket, this caught my interest. I found myself asking the question 'if I'm fortunate enough to be here for that long then how can I make best use of it.' I'm guessing that I won't be alone in asking that kind of question. Yet rather than entertain the notion of having plenty of time to wander down many paths, the opposite is true. Because if we are to survive and thrive for far longer than immediate past generations then we are going to need to have skills that are of real value. There will be plenty of people who can do a little of this or that, but far fewer who have focused their energy and effort on developing and honing useful skills. So path choosing should not be taken lightly. If you are very young then chose your path based on your passions. The more energy and enthusiasm you can bring to skill building, the more effective it will be. As a youngster you don't have to worry too much about the latter stages of your life. You can plough on knowing that whatever you're doing now won't be forever. You need not worry about getting bored; you won't be doing it for long enough. Yet when the time comes to change path, and it will come, so then is the time to consider where ending up will be your 'big deal'. 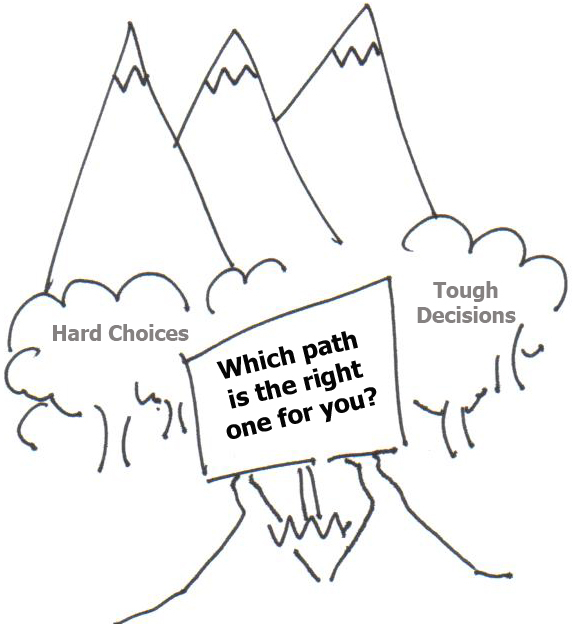 Coaching has attracted many thousands who've made their second path choice. For some, this was a bad decision. For one or two in every thousand, it was the best choice they could ever have made. If you are at this stage then you should take some time to consider carefully if this path is really for you. Start by asking yourself some tough questions about your own end game. If you can be clear about what you hope to gain and where you want it to lead you, then it's a good start. If you struggle with gaining clarity then don't start until you do. There are plenty of people who've found themselves caught up in what felt like a great idea, only to discover that it was ever going to give them what they really needed. There are few things quite as exposing as coaching. Actors may hide behind their characters, singers behind their songs and comedians their material, but coaches perform as themselves. There is nothing to shield you and nowhere to hide; you are always only as good as the perception of your clients and will be judged on everything you say and do. It is a brutal existence. You are your product. You are your service. Professionally you live or die on whatever comes out of your mouth. Never in your working life will it have been so important to be on top of your game; and on top of your game is where you need to be all the time: Being a nice person isn't good enough. You either get results or you're not worth investing in. Ordinary coach training will teach you the basic skills of coaching. It's not difficult to learn. On the whole you should get all the formal earning you need in about 40 hours or so of training with plenty of supervised practice and support. Add to this some appraised work and you can find yourself a certified or qualified coach. However this is just one key to one door; it won’t provide enough to achieve your ‘big deal’. Success will come from a combination of preparation and expectation; the combination of previous experience blended with appropriate skills training and honed with adequate practice plus a clear idea of what you want, where you are going and what you are ultimately doing it for. For those with the requisite skills and experience Executive Coaching offers lucrative opportunities to develop a career in this fast growing leadership support function. However this is difficult to access without proper accreditation, no matter how experienced a leader you are or how proficient you may be with NLP. Many experienced leaders with NLP training and significant experience balk at the idea of undertaking coach training, significant parts of which may duplicate their existing expertise. Often experienced NLP practitioners will have moved into the field of coaching and may have been practicing successfully for some time without any accreditation. Therefore learning how to build rapport or engage in active listening may be a necessary element of coach training but not relevant to the experienced non-accredited coach. In the grand scheme of things coaching is relatively new and is still developing ways in which to accurately communicate what it does and how it does it. Like any acquired skill a competent coach can make it appear effortless to an observer. A skilled chef coordinates a busy kitchen; holding in her head essential knowledge about ingredients, cooking methods, the science of food combinations and leadership skills to harness the best from her team. Yet can appear to orchestrate the production of a restaurant full of fabulous meals night after night as a matter of routine. So it is with a skilled and practiced coach. He or she will have spent years studying and gaining practical experience in the application of coaching models that are brought together in just the right quantities and with the correct timing to produce outstanding results. Unlike the chef however, the coaches recipe will always be unique; they will know which ingredients to bring to the table but it won’t be until the client participates too that the exact recipe for that particular individual comes to light. Clearly, experience gained outside of coaching can be invaluable; particularly if that experience has been gained in management and leadership. However it is not enough to enable a person to become a coach, any more than eating at a restaurant qualifies a diner to become a chef. Although variously described, you can pretty much distil coaching models down into half a dozen sub-headings. One is a mixture of ‘client led’ approaches that have developed in response to breakthroughs and insights over the past forty or so years. Another has come about through the adopting of theories about the way people act and react to the world around them, another from specific research into what makes people change what they do. Two have been adapted from existing psychological ‘approaches’ and only one was specifically developed as a genuine coaching model. The others however are just a valid as coaching models even though they didn’t come about in that way. The first Client Led model includes something called the ‘inner-game’, the ‘grow’ model and ‘co-active’ coaching. Simply put, the inner-game recognises that all people have a dialogue going on inside their heads; and that to create effective change that internal dialogue must be aligned with conscious goals if conflict is to be avoided. The ‘grow’ model is a simple methodology tool; a route map for coaches to follow that puts the client in charge of their own destiny but allows the coach to help them get there. It’s an acronym for establishing a ‘goal’, recognising ‘reality’, exploring ‘options’ and establishing ‘willingness’ to act. Finally co-active coaching is a relationship positioning approach; it puts the client firmly in the driving seat with the coach as a facilitator to draw from the client everything they might need to change. The second model derived from a theoretical approach is called ‘integral’ coaching. It’s very useful as it provides an overarching framework from which to look at any coaching issue. Often described as the ‘Wilber’ model it suggests that any issue can be looked at as a matrix of four quartiles: Imagine a horizontal axis detailing a person’s perspective; that being either ‘internal’ or ‘external’. The vertical axis then suggests either an ‘individual’ or ‘collective’ understanding of the world. This provides a coach with a way to prompt the client to think about an issue by exploring the four quadrants: (Top left) their internal perspective and personal understanding of what’s going on. (Top right) the way other people perceive them and what others people might understand is going on. (Bottom left) The way their ‘group’ perceives things and the collective understanding from that group as to what it all means. Then finally (bottom right) is the way the world might perceive and understand the situation (by using existing labels or concepts). 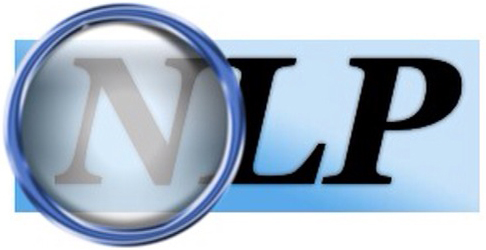 The third model flows from specific research and is the NLP or multi-modal model. This is based on the principles of unconscious processing of information and communication. It suggests that the client will be influenced by events in ways that are not necessarily intuitive, and it suggests coaching tools like ‘appreciative enquiry’ (drawing from the client without influence), ‘clean language’ and ‘metaphor’ (influencing without agenda) and ‘meta-models’ of unconscious processing of information. By establishing the client’s goal a coach can use this model to help change behaviour by combining conscious and unconscious activity. The fourth and fifth models both have applications outside of coaching and come from the world of psychology. Fourth is the model of ‘positive psychology’ and 'solutions focus'; it focuses on beliefs, values and needs in the search for ultimate happiness or a specific solution. It can include models that involve the transfer of knowledge or skill as well as drawing action and intent from the client. The fifth model of ‘behavioural coaching’ draws from extensive psychological work in conditioning and adapting of behaviour as a science. Designed as a Coaching Model the sixth model is that of ‘ontological coaching’. Specifically developed as a coaching model this is as much a philosophy as a practical tool. It uses slightly different language to the other models and begins from principles rather than behaviour. It focuses on the clients ‘way of being’ and pulls together the triad of language, emotion and physiology. It suggests that the combination of what a person says, feels and does becomes ‘who’ they are. Hence only by exploring those and any ‘breakdowns’ within them can a person reach their goals. The International Academy of Busness Coaching and Training is based in Tenerife. It utilises the long warm sunny days to stimulate enhanced learning: More content and learning practice is achieved in less time.